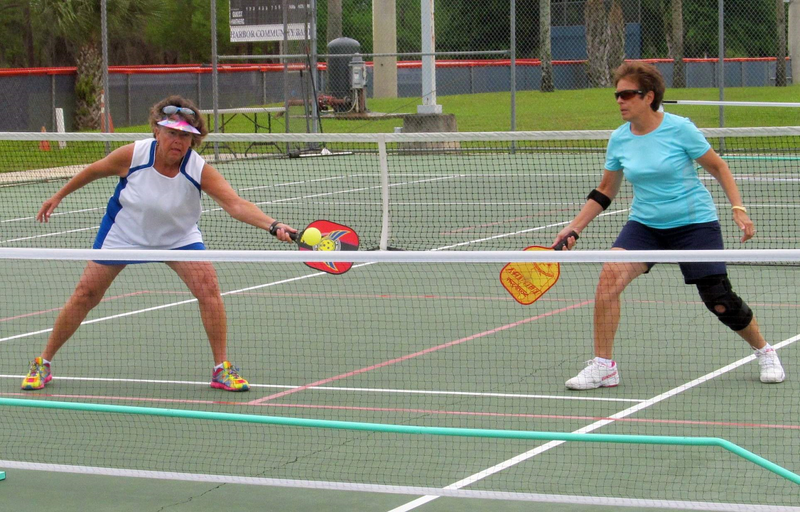 On Friday, 22 men and 18 women competed in the Heartland Games for Active Adults Pickleball Tournament. The men’s teams came from Reflections on Silver Lake, Tanglewood, Highlands Ridge, Sebring Village, Sun ‘n Lake, Valencia Lakes and Sun City Center. The women represented Tanglewood, Highlands Ridge, Crystal Lake, Solivita, Valencia Lakes and Sun n Fun-Sarasota. As there weren’t a lot of competitors, players were grouped in the following age categories to provide ample competition: men 50 to 69 and 70 to 79, women 55 to 64 and 65 to 74. Medals were awarded in age brackets spanning only five years. For the men, the Highlands Ridge tandem of Mickey Dorman and Chris Donaghy captured the gold medal in the 50 to 54 age bracket. In the 65 to 69 age category, the Valencia Lakes duo of Mike Kates and Gary Nicolay took home the top honors, with the Tangelwood tandem of Neil Simpson and Dan Pillitteri grabbing the silver medal. The Sebring Village team of Ross Myles and John Prenctice earned bronze medals.